The study by scientists from the ARC Centre for Excellence for Coral Reef Studies at James Cook University reveals the impact that rising carbon dioxide (CO2) levels could have on the ocean food chain. "We found the carbon dioxide made the cone snails hyperactive," says lead author Dr. Sue-Ann Watson. "But despite moving three times faster than normal they caught fewer prey. They meandered around instead of moving by stealth and sneaking up on their prey." Cone snails typically hide in the sand to surprise their enemy. They harpoon their prey using a powerful venom which can also be fatal to humans. 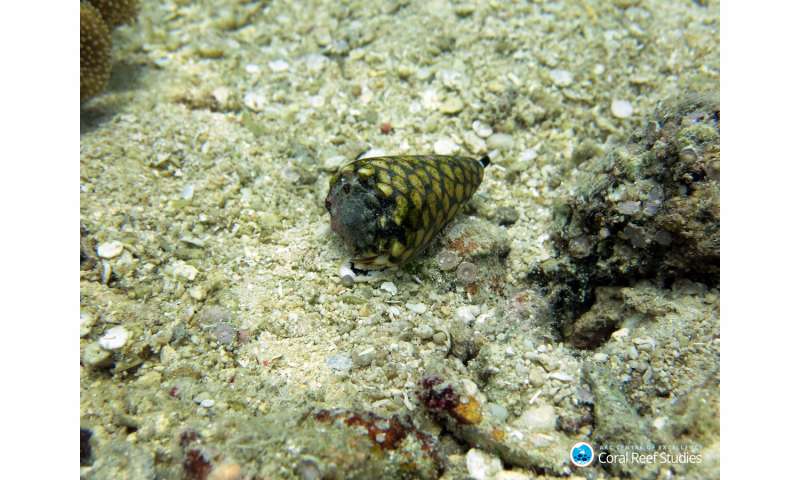 Scientists took cone snails from around Lizard Island, on the Great Barrier Reef, and put them into tanks with a popular cone snail delicacy - jumping snails, but only 10 per cent of the cone snails under the influence of elevated CO2 managed to catch dinner compared to 60 per cent of those kept in tanks under normal conditions. Ocean acidification occurs when the ocean absorbs carbon dioxide from the atmosphere, resulting in chemical changes as the pH of the water decreases. "We already know that ocean acidification will weaken snails' shells and this new research shows it can also affect their energy levels by increasing activity while at the same time decreasing their food intake," says Professor Philip Munday. Previous work by Dr Watson has shown that behaviour of the cone snail's prey, such as jumping snails, is altered by rising CO2 levels. This new study shows that predator behaviour is affected as well. "As the behaviour of species change under these conditions, so too can the relationship between predator and prey. The results of this study could have implications for food chains beyond cone snails and their prey." "Marine snails and other molluscs are important for the ocean food chain and are also resources for humans. If their behaviour changes, there could be a flow-on effect in the food chain - these changes could potentially affect commercially important seafood species," says Dr Watson. Wrong. They don't know that, at least not from their poorly-designed experiments. What they do know is that if they more than double CO2 in the water to 975 µatm from the current average of around 400 µatm and put biological specimens in that water, they behave differently. Any idiot could tell you that instantly changing the environment of sea creatures will adversely affect them.